How to convert a 4-channel image to 3-channel image in an elegant way? I have a 4-channel image (RGBA). I want to reduce its channel count from 4 to 3. The method I am using currently is to Right click and Save as a .png file. After that when I Import it in Mathematica, the channel count is reduced to 3. Is there a more elegant way to do that? Note: RemoveAlphaChannel function won't work. Because that will change the appearance of the original image (see the example below). img = Import @ "https://i.stack.imgur.com/XvzDc.png"
@kglr 's solution is very convenient and powerful. However RemoveAlphaChannel[#, colorname]& does not work for all the cases. So I spent some time searching in the web about image channels and found the principle of the alpha channel. Based on that, I get the following solution which can used for other cases(different images with different alpha channels). It given me the image exactly what I want. Exciting! BTW, I am a mathematica newbie, so be free to correct my code and English grammer. How can I transfer colors from first image into second image? How to select components selected via SelectComponents? 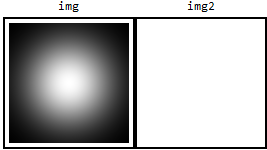 How to apply GradientFilter locally to an image? How to maximally crop a rotated image? What is the logiс behind handling alpha-channel by various image-processing functions?